We’ve got a Halloween-themed giveaway for you today: throw your name in the hat for two high-interest nonfiction series from our new Hungry Tomato™ imprint: Real-Life Monsters and Mythical Beasts! They’re creepy, ugly, and dangerous…and they also happen to be real. 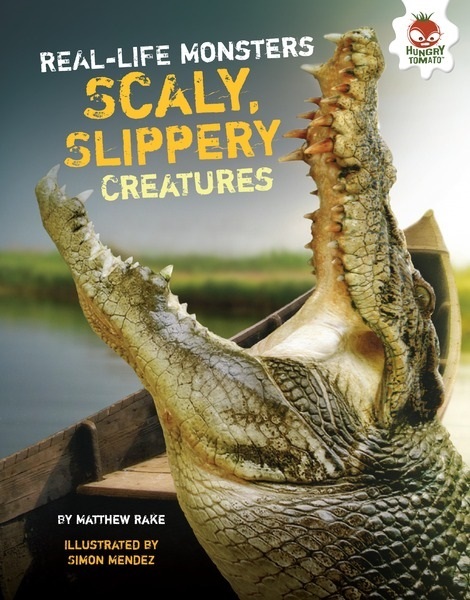 Get an up-close-and-personal look at some of nature’s most monstrous creatures from around the world in our new Real-Life Monsters four-book series. Find out where they live, what they do, and what might happen if you run into them! Readers will be able to compare and contrast the traits of various animals and distinguish what makes each one seem so frightening. Mythical Beasts is a four-book high-interest series takes a celebrity-profile approach to the mayhem-causers of ancient myth. Drawing on tales from around the world, each book ranks a motley crew of legendary monsters to see who’s the most dangerous. Each legendary figure receives points for skills, strength, and general repulsiveness―and readers collect myth-based advice on how to defeat it. If you’d like to win all eight books, please leave a comment on this post (including your first and last name), or tweet this line: Free Book Friday! Tweet to win Real-Life Monsters AND Mythical Beasts from @LernerBooks. bit.ly/1OrSN Make sure to check the blog next week to see if you’ve won! Fall + Nonfiction = Fun! My library kids would go bonkers over these series! These are great for my library. It's good to remember that some kids want non-fiction! I would love these for my boys! I teach ancient history and these would be great books to tie in with what I am teaching in class. I've never seen anything like this before. I'm at the middle school level. Thanks for the chance.